Lead levels that are 'off the scale' have been confirmed after tests were done this morning on the lid of a soup can dating back more than 150 years. 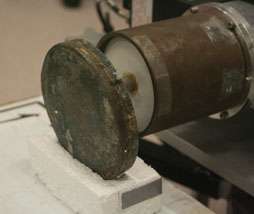 (PhysOrg.com) -- Lead levels that are "off the scale" have been confirmed after tests were done this morning on the lid of a soup can dating back more than 150 years. The findings reopen the mystery surrounding the cause of death of Sir John Franklin and his doomed crew as they searched for the Northwest Passage. Fiona McNeill, associate vice-president, Research, and a professor of medical science and applied radiation, says tests were conducted using x-ray fluorescence, a non-destructive method of analyzing artifacts. McMaster is one of two centres in Canada with this specific kind of x-ray fluorescence capability. As soon as the four-inch diameter lid from the can was scanned, says McNeill, "the numbers showed us lead levels that were pretty much off the scale. It was an instantaneous test. We had already tested the soup found in the can and found high levels of lead, so we were certain we were going to find similar levels in the sealing solder." Franklin set sail from England in 1845 on his fourth Arctic exploration to map the final section of the Northwest Passage. But something happened when his ships became stuck in ice, and the crew was never heard from again. The loss, considered the biggest disaster in British naval history, triggered numerous search parties. In 1988, bodies of some of the crew were found, preserved in the permafrost. The can of soup being tested was found on Dealy Island, and though it was left behind by a search party dispatched from England in 1852 it would be virtually identical to the provisions consumed by Franklin and his crew. With the lead levels confirmed, McMaster's Department of Anthropology will next make a batch of the ox cheek soup and can it using methods from the 1840s. Over the course of a year the cans will be opened and analyzed. Researchers will then be able to gauge how quickly lead leaches into soup rendering it lethal. Lead poisoning has long been considered a cause of death for the ill-fated explorers. The soup can is part of the collection of the Royal Ontario Museum. Public fascination with the Franklin Expedition has not abated over time, says Ken Lister, curator of anthropology at the Royal Ontario Museum. "The two ships from the Expedition have never been found, and as recently as this past summer people were still out there looking for artifacts." Fifteen years ago, McMaster University analyzed the bones from the Franklin crew and found lead levels that were higher than researchers had detected in any living human.